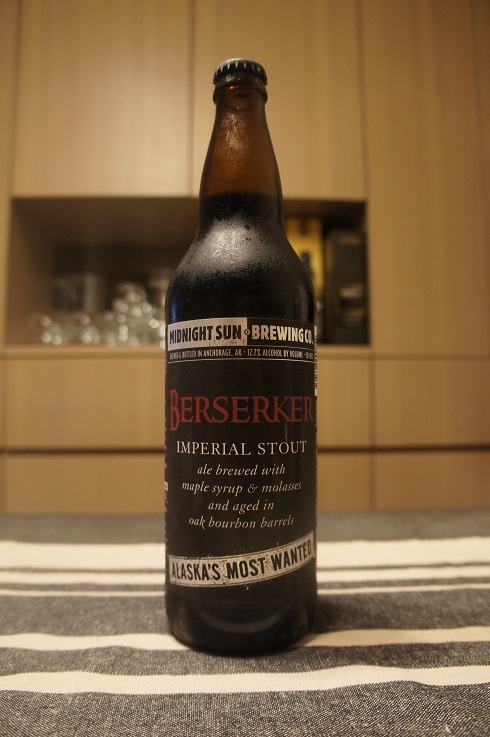 Category Archives: Midnight Sun Brewing Co.
Brewery: Midnight Sun Brewing Co. 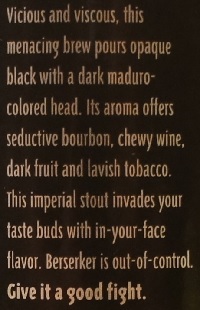 Brewer Description: (from bottle) Vicious and viscous, this menacing brew pours opaque black with a dark maduro-colored head. Its aroma offers seductive bourbon, chewy wine, dark fruit and lavish tobacco. This imperial stout invades your taste buds with in-your-face flavor. Berserker is out-of-control. Give it a good fight. Intro: A 22 fl. oz. bomber with no clear bottled on or best before date. Poured into a snifter. Appearance: Black in colour with a one finger brown head that dissipated fairly quickly to a ring around the glass while leaving some sparse lacing. Aroma: Molasses, brown sugar, maple, chocolate, banana bread and bourbon with hints of coffee and oak. Taste: Sweet molasses, milk chocolate, maple, dark fruit and bourbon with hints of oak, bitter char, smoke and coffee. Mouthfeel: Creamy, smooth, medium to full bodied with low carbonation. Overall: Nice aromas and taste but perhaps just slightly too sweet for me. The molasses were also a bit overpowering and I would have preferred more maple coming through.